Editor’s Note – Weeds are something that every yardfarmer has to deal with. To prevent weeds from taking over your garden without using chemicals, you can use a variety of techniques including presprouting, mulching, and solarization. Read below to learn more. This article was originally posted on FIX.com and written by Christine McLaughlin. Preparing for the weed battle is top priority for every gardener. But for those of us who leave herbicides out of our arsenal, it can be extra challenging. I approach natural weed control from an interesting angle and just assume that weeds have a brain. The truth is that weeds are smart. These masterful nutrient-sucking water stealers can prove it by creating havoc in record time. Weeds have had thousands (and thousands) of years to successfully adjust to every attempt on their lives – whether it’s by nature’s or the gardener’s hand. So we need to outsmart them in order to stay one stem ahead of them. Let’s look at some natural weed control techniques that’ll keep you from resorting to toxic herbicides. Weeds have come up with some clever ways of reproducing themselves. They do so by seed, pieces of root, and stolon. A stolon is an above-ground plant shoot that produces roots from a node that’s pressed against the ground. The first line of defense is a raw, straightforward approach to weeding. This “presprouting” technique is perfect in the vegetable garden for addressing early spring weeds. The basic premise is to watch for those first weeds of the season (early spring) to rear their ugly heads and then instead of pulling them up one by one – simply whack off their heads! The idea here is to actually encourage the weeds to show up. Begin by making up the garden bed in preparation for vegetable planting, but do so about three weeks before you’re actually going to plant your crops. Make the bed as inviting as possible by adding compost, manure, and any other amendments necessary to ready the soil for plants. Rake in and level everything and then water it well. It won’t take more than two weeks for those weeds to start showing up. 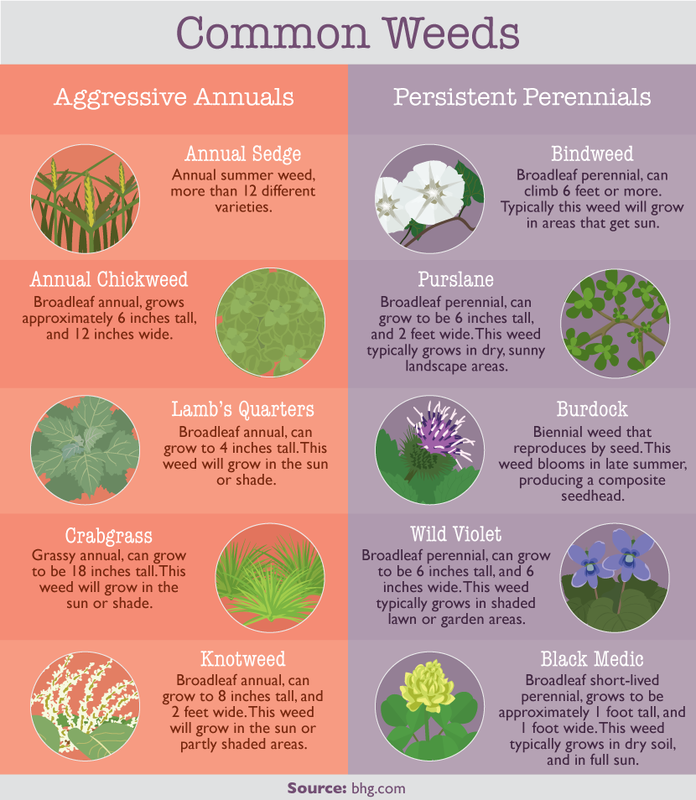 Many of these first spring weeds will be annuals (although not all of them). Once they have grown about 2″ inches tall, use a stirrup hoe to scrape just under the top of the soil, knocking every one of those bad boys down. You’ve just wiped out a ton of potential weeds. You can presprout as many times as you’d like before you plant your garden. I take such personal joy in whacking them down, that I do it at least twice. It certainly won’t solve every problem for the season (weeds are clever, remember? ), but it’s a beautiful first round. Solarization is another method of weed control that works best in garden beds including neither perennial plants nor foundation plantings. It’s a technique that requires covering up the entire bed in order to fry whatever is trying to grow underneath. Bonus: This method also destroys pathogens, nematodes, and plant-eating insects that are residing in the soil! On the other hand, it’s fair to say that solarization doesn’t respect the difference between good and bad insects. All you’ll need is direct sunlight, a hot month or two, and clear plastic the size of the garden bed. Before laying the plastic down, prepare the bed for planting in advance. This way, once the plastic is removed from the bed, the soil doesn’t need to be disturbed. Anytime you mess with the soil, you bring dormant weed seeds closer to the surface where they germinate. The plastic can be any thickness that you’d like (1–4 mil). However, keep in mind that thicker is going to be better for windy areas and will last longer. That said, any plastic roll found at your local hardware store will work fine for at least the season. Ideally, the plastic should be clear (transparent) as that tends to trap heat underneath, making it more effective than black plastic, which absorbs and deflects some of the heat. Lay the plastic flat against the surface, pulling it snug as you secure the ends and sides by burying them or using rocks, bricks, etc. When solarization is at its best, the top 6″ of soil will heat up to around 140°. This weed control method can take 4 to 6 weeks, so remember that you’ll lose that amount of growing time in that particular bed. That said, solarization is a great natural weed killer and is usually worth it. Gardeners often rotate this technique between garden beds. If you only use one natural weed control, let it be this one: keep all exposed soil covered. There isn’t a garden in the world that doesn’t benefit from using some type of mulch on naked soil. Blanketing bare soil with mulch offers the garden many advantages. It drastically reduces the weed population by obstructing the sun from reaching weed seeds. It also insulates the roots of your plants against temperature fluctuations, retains moisture in the soil by diminishing evaporation, and reduces (or prevents) soil erosion caused by wind and rain. 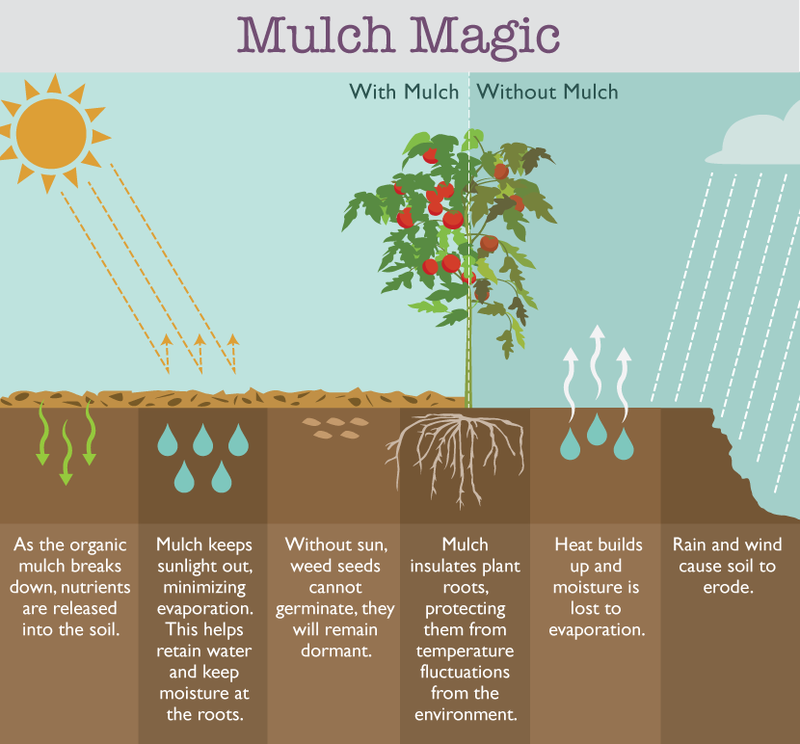 Mulching saves the gardener time, money, and effort. It can be made of organic or inorganic materials. Both get the job done but organic mulches will need to be replaced periodically as they break down into the soil. Technically this is more work for the gardener, but organic materials also build soil texture and tilth. When choosing a mulch, you should consider the individual garden. Is it a vegetable bed? Perennial flower bed? Foundation landscaping around your home? 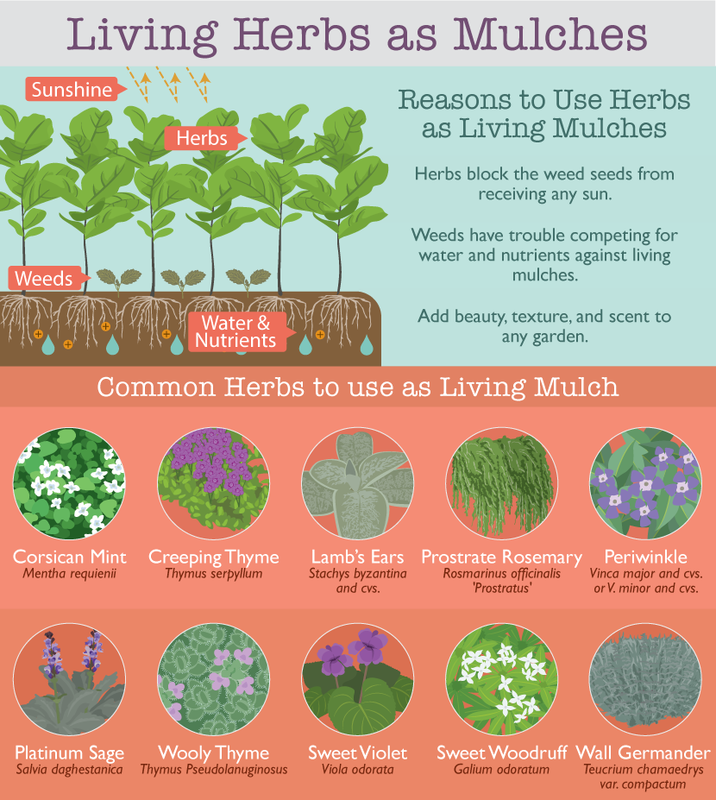 For example, inorganic mulches, wood chips, and living mulches (live groundcover) work well with permanent beds such as foundation plantings around the house and perennial flower beds. The plants in these areas aren’t continually being switched out the way they are in veggie gardens or annual flower beds. Permanent beds are great spots for inorganic materials since these mulches don’t break down like their organic counterparts do. Something else to consider is the location of your garden. For example, newspaper as mulch is ideal for front yard flower beds because it can be hidden. Several layers of wet newspaper topped with a more attractive mulch such as shredded bark would work beautifully here. Organic mulches such as straw, newspaper, dried leaves, and grass clippings are best used in your vegetable garden. An odd choice of living herbs as mulches! Vinca is a non-native invasive that can easily get out of hand as can sweet woodruff. I’m still trying to eradicate them twenty years after planting them in my flower beds. I can’t imagine what a problem they could become in a vegetable garden. As for weeds, lambs quarters and purslane are considered nutritious edibles by some! And native wild violets can be helpful to pollinators, as well as being host plants from some butterflies.